Scoring perfect bound book covers inline, regardless of grain direction, is easy with the Technifold Spine-Hinge Creaser. 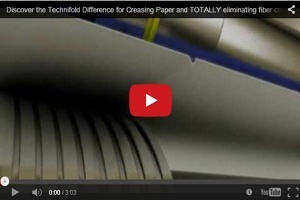 Video shows how to change creasing ribs to get the correct crease on any weight of paper stock. Device for Muller perfect binders also has infinitely variable female channel width adjustment for precise control of creasing.